Though the exact year is unknown, Eureka's long history begins prior to 1895 in Binghamton, New York, where the company still resides today. Then known as the Eureka Tent & Awning Company, its first wares were canvas products--most notably, Conestoga wagon covers and horse blankets for nineteenth century American frontiersmen--as well as American flags, store awnings, and camping tents. The company increased production of its custom canvas products locally throughout the 1930s and during the 1940 and even fabricated and erected the IBM "tent cities" just outside Binghamton. The seven acres of tents housed thousands of IBM salesmen during the company's annual stockholders meeting, which had since outgrown its previous locale. In the 1940s, with the advent of World War II and the increased demand for hospital ward tents, Eureka expanded operations and began shipping tents worldwide. Ultimately, upon the post-war return of the GIs and the resultant housing shortage, Eureka turned its attention to the home front during the 1950s by supplying awnings for the multitude of mobile homes that were purchased. In 1960, Eureka's new and innovative Draw-Tite tent, with its practical, free standing external frame, was used in a Himalayan Expedition to Nepal by world renowned Sir Edmund Hillary, the first person documented to summit Mt. Everest only six years earlier. In 1963, Eureka made history during its own Mt. Everest ascent, with more than 60 of its tents sheltering participants from fierce 60+ mph winds and temperatures reaching below -20¡ãF during the first all American Mt. Everest Expedition. Eureka tents have also traveled as part of several historic expeditions, including the American Women's Himalayan Expedition to Annapurna I in 1978 and the first Mt. Everest ascents by a Canadian and American woman in 1986 and 1988. In recent history, tents specially designed and donated by Eureka sheltered Eric Simonson and his team on two historic research expeditions to Mount Everest, this time in a quest for truth regarding the 1924 attempted summit of early English explorers George Mallory and Andrew Irvine. During the 1999 expedition, the team made history finding the remains of George Mallory, but the complete mystery remained unsolved. Returning in 2001 to search for more clues, the team found amazing historical artifacts which are now on display at the Smithsonian. In general, it's wise to choose a tent that's designed to withstand the worst possible conditions you think you'll face. For instance, if you're a summer car camper in a region where weather is predictable, an inexpensive family or all purpose tent will likely do the trick--especially if a vehicle is nearby and you can make a mad dash for safety when bad weather swoops in! If you're a backpacker, alpine climber or bike explorer, or if you like to car camp in all seasons, you'll want to take something designed to handle more adversity. Families who plan on car camping in good weather can choose from a wide range of jumbo-sized tents that will accommodate all your little ones with room to spare. A wide range of capacities is also available for three- and four-season backpacking and expedition tents. Remember, though, the bigger the tent you buy, the heavier it will be, although it's easy to break up the tent components among several people in your group. It's also helpful to compare the volume and floor-space measurements of models you're considering. I spent endless hours online looking for a good tent. 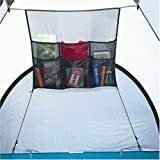 This was my first time camping and I was not sure at all what type of tent to buy. There is simply too much to chose from. I was basically looking for a reasonably price 3 season tent with good rain protection. Eureka SUnrise had the best reviews and I decided to go with this one. We went for 2 nights camping at Acadia National Park in Maine. I tried to put it together myself alone but it was too hard to do it. I had to ask a friend to help me out. WIth 2 persons it is very easy to put up. The feature i liked the best was the 4 windows. It was a bit hot during the day and the cross ventilation kept the tent inside cool. At night it got a bit cold so we zipped the windows and after that it was nice and cozy inside. It did not rain so can't comment on that aspect. It was easy to fold it and took a lot less time. The poles are a little heavy so if you have the $$$ then I would suggest to go with light weight aluminum pole tent. I gave this tent 4 stars because the tent description said that even a single person can put it up but I found it very hard to do it especially there is no way a single person can put the rainfly by himself. The tent is 7 foot hight at the center and the rainfly has to go over it. You have to put the rainfly on the ground flat first, put the poles in it and then lift it and put it on top of tent. It is a huge rainfly and if its windy it is almost impossible for a single person to do it. 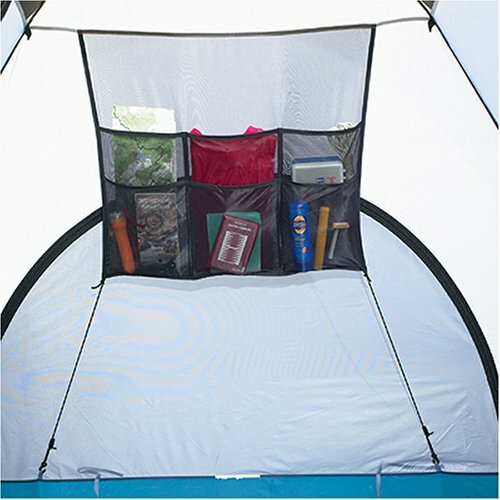 A nice tall tent with pockets and cupholders! We bought this tent to replace a similar Eureka tent that lasted more than 10 years. We love our new Eureka tent! We didn't even use seam sealer, but it still stayed dry inside during rain on our recent camping trip. The old tent had four main poles that connected to a center piece, and it was very easy to put up, even by one person. This new tent is just a little harder to put up because there are two very long main poles that arch across the top from corner to corner. We decided that the best process for putting it up was to first stake two corners on the same side of the tent. Then, with the tent flat, we put the two poles through the sleeves and attached them at the two staked corners. Next, the two of us each stood an an unstaked corner so we could simultaneously arch the two poles and fasten the other ends in place. Finally we staked down the third and fourth corner and the sides. Putting up the fly was a breeze. We looked around at a number of family tents. We purchased one and found that it was extremely difficult to set up in even the most minimal amount of wind. My wife and I are both experienced campers and hikers so we were surprised when we couldn't get the tent up properly. We even borrowed a friend's family tent and proceeded to rip the base the first time we tried to stretch the tent out to stake it. This tent is different. It is logical to put up. Once up it is spacious. The first time we put it up only took ten or fifteen minutes (include the time to yell at our 1 year old and 3 year old to get off it or we can't put it up). Internally it has some nice storage features (lots of little pockets and places to store items). I never thought any of that kind of stuff was usefull or necessary until trying to find where the diaper cream went amongst all of the sleeping bags. The tent has nice features without appearing loaded with gimmicks. And here is the real clincher - the sack that the tent comes in actually fits the tent. Not like you have to bring a hydraulic press to squeeze it in - it actually fits. What a relief after a long weekend of camping. I have never written a review before but was moved enough by the quality of this product. The only downside I can think of - the stakes included are the cheezy plastic variety that don't always work in all soil types. And there is not a waterproof assembly instruction printed on the bag (always a nice touch but not needed here since assembly is so logical). Also the way the rain fly goes on is a bit odd (attaching the cross poles to the fly and THEN sliding it over the top). It's roomy and keeps us dry. All in all, I'm happy I chose this tent. I took it camping in Michigan, and after pre-seam-sealing and two thunderstorms, there were a few droplets of water that leaked in through a couple corners. Not bad, compared to the river that ran through my last tent! At least now I know where to put extra seam-sealer next time. Besides the enjoyable amount of space inside, I absolutely loved having little cloth hooks sewn in around the tops. I took a few plastic hangers with shoulder hooks with me, and I had a place to hang an overhead flashlight and very lightweight clothing items to air out. I wouldn't recommend hanging anything heavier than a light cotton shirt, but the chance to take advantage of the vertical space made it worth the investment in a taller, heavier tent. It comes with two detachable mesh bags to hang on the walls, and one larger pocket organizer built into the back wall--this last one was more of a nuisance because it hangs straight down, without a good way to tie it down and away from taking up space in the middle of the floor. I didn't use it, so I might cut it out the next time I set up the tent. Best tent money can buy!